Common reptiles are afforded limited legal protection under Schedule 5 of the Wildlife & Countryside Act 1981 (as amended). 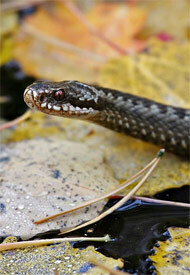 » Assess the presence or likely absence of reptiles within the site and its local environs. » If reptiles are found to be present on the site, give an indication of the population size of each species present. Our ecology surveys, ecological surveys and ecological surveyor (ecology surveyor) practice throughout London and the South UK including places like Hampshire, East Sussex, West Sussex, Surrey, Berkshire, Kent, Essex, Hertfordshire, Bucks, Ilse of Wight and Oxted, Slough, Brighton, M4 Corridor, Dover, Peacehaven, Fulham, Royal Tunbridge Wells, Rottingdean, Polegate and more! 23/04/19.